In the past years, PSY's global Youtube phenomenon Gangnam Style have brought South Korea's Gangnam District to the spotlight and its Beauty Belt. Now, it is not uncommon for both Koreans and international medical tourists to come looking for "Gangnam Plastic Surgery". There are about 500 plastic surgery clinics in Gangnam District alone, and perhaps it is one of the only places on earth to see such an amazing scene. 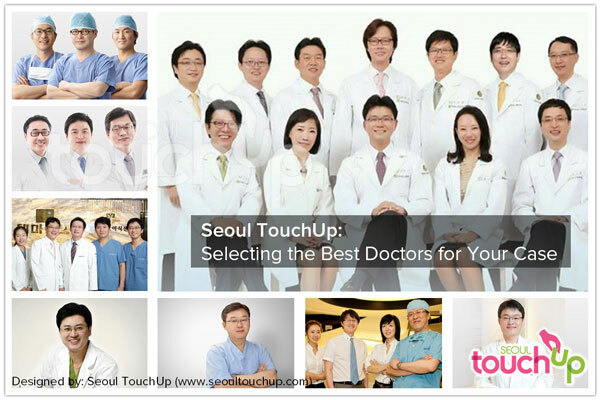 Seoul TouchUp partners with most of the major and social proven clinics in Gangnam District. It is extremely competitive to survive in Beauty Belt without a consistent number of customers, and becoming a plastic surgeon is now the most coveted but difficult profession for eager young minds in South Korea. Many tourists acknowledge that South Korea is equipped with cutting edge medical facilities specializing in life-changing beauty procedures, which can be compared to the very best in the world. In fact, Korea now has much more to offer than many other countries in Asia regarding medical services. But, did you know this was not always the case? Before the early 1980s, the area had remained one of the least developed in Seoul. Now, Seoul's affluent Gangnam area is highly regarded as the center for plastic surgery and life-changing beauty procedures. Several decades ago, the Korean culture had very little to do with cosmetic surgery or flashy, glamorous K-POP stars. Back then, it was filled with rice paddies and was one of the least developed areas in all of Seoul. Then there were roads and bridges by the 1960s. By the 1970s, apartment buildings could be seen, and perhaps one of the most significant events that helped boost the urbanization of Gangnam, was the Seoul Olympic Games in 1988. By and by, more and more infrastructure was built and soon, high-rise buildings were a common sight. In 1996, there was enough resources, expertise and technology for a plastic surgery industry to be built. Now, only the very wealthy can afford to live in Gangnam. The streets of Gangnam is also known for its trendy and upmarket boutiques, COEX mall and clusters of cosmetic surgery clinics. Amidst the hustle and bustle of Gangnam district, one can never go past the streets without spotting a cosmetic surgery clinic. Ever since the Korean Wave had swept through the world in the early 2000’s, Gangnam is fast becoming one of the most sought after destinations for cosmetic surgery. Located at the heart of Gangnam is Apgujeong, the Beverly Hills of Seoul, where sophisticated and luxurious shopping areas can be found here. But perhaps the most striking feature of this popular area is that there are more than 200 clinics in Apgujeong alone. It is a common sight to see 5-10 clinics in one single street. Note: On cosmetic surgery advertisements in Apgujeong, the potential side effects from surgery are written in small print letters. Over the years, Seoul TouchUp has witnessed the establishment and liquidation of clinics, large and small, to know all that goes on in the Korean cosmetic surgery industry. Some clinics are so big that it really feels like a factory. Some are medium-sized and more VIP-oriented. “Which clinic is more popular among Korean locals?” But it has gotten confusing even for Koreans to choose a plastic surgery clinic now. Not only because of the number of clinics, but also because of the omnipresence of plastic surgery clinic advertisements. Koreans are constantly bombarded with charming ads by hundreds of clinics at every corner of subway stations in Korea. It is seen more evidently not far from Apgujeong street, at the famous Gangnam Station. On the walls of Gangnam station, plastic surgery advertisements can be found all around. 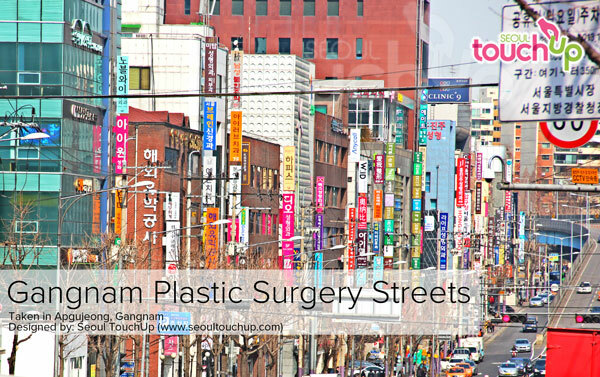 Gangnam Station is also a home for plastic surgery and you can find a further 200 clinics around the area. South Korea is well-known for its competitive nature in the country. Most popular plastic surgeons in the Beauty Belt have graduated from prestigious Korean universities such as Seoul National University and Yonsei University. Although only the top 1% of graduates become professional and board-certified surgeons, what happens if you have hundreds of them in the country? Competition. Since the late 2000s, Korea has entered the age of oversupply of plastic surgeons and it now has become crucial for plastic surgery clinics to focus on international customers to fill the gap. To stay competitive, it would be unavoidable for the doctors to learn and come up with new and innovative techniques based on years of experience in the industry. What is more interesting is that plastic surgeons in Korea started to specialize in what they are really good at. For example, some specialize only in eyelids, and some specialize in facial bone contouring and show off numerous plastic surgery cases they have performed. Competition is good for international customers because doctors are getting better everyday and agencies like Seoul TouchUp can help you choose the most ideal surgeons for your specific cases. However, there are also incompetent surgeons, which have been highlighted in the media. In South Korea, anyone with a MD degree can become a plastic surgeon. They are not board-certified doctors but still permitted by the Korean jurisdiction to practice plastic surgery. There are also junior plastic surgeons who just graduated from their medical schools and hope to have some hands-on experience. Although Seoul TouchUp never associates with these types of doctors, many clinics employ them and don't inform international customers. Some of them are known to be "shadow doctors" who operate on a patient on behalf of the actual directing doctor when he/she is unconscious from general anesthesia. Patients, of course, are not aware of this and it is maybe the one of the biggest downsides of contacting clinics directly. Seoul TouchUp’s experience and reputation promises your utmost protection from scams of that sort. With Seoul TouchUp, one can expect only board-certified and fully qualified surgeons with at least 10 years of experience to be at your service. Where Do Koreans Get Their Plastic Surgery? 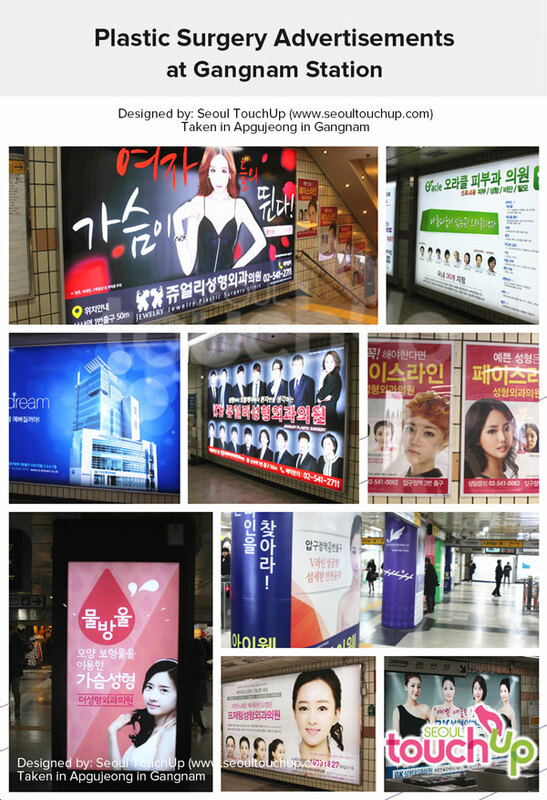 The two most popular areas in the Beauty Belt is Apgujeong streets and Gangnam station. Korean plastic surgery boom had its humble beginnings here and it is not unusual to see people wearing big sunglasses to cover up their after-surgery swellings and bruises. Despite Gangnam's relatively higher plastic surgery prices, many Koreans still opt for Gangnam for the excellence of plastic surgery, even if they are from places like Busan (2nd biggest city in Korea) or Daegu (3rd biggest city in Korea). Plastic surgery is a once-in-a-lifetime decision and Koreans also hope to find the most ideal clinic and doctor for their cases. Seoul TouchUp hopes to provide services in the same way for medical tourists who are traveling great distances from outside of Korea. Although no one wants medical tourists to have bad experiences in Korea, unexpected things do happen if it is not arranged professionally. There are some internationally recognized clinics in Gangnam such as ID, Regen, BK, JK, JW, Grand, etc. One of the most popular questions that Seoul TouchUp gets from customers is "Which clinic is the best in Korea?" and our answer is "It depends." Because of the competitiveness in the plastic surgery industry, clinics decided to specialize in certain surgery and honed their special skills with even more "practices". It is also important to note that there are clinics that are more popular among Korean locals than international customers. Usually, medical tourists choose big clinic or hospital names. However, please remember that no clinics will advertise themselves as “bad”, so take caution there and make sure to do due diligence. All in all, in the 21st century, just having a website catered to both English and Chinese speakers does not make a clinic good enough nor reputable. Some are overhyped, underrated or simply unknown gems. Making a life changing decision just based on a website is not the wisest of decisions. We advise any interested person to consult with Seoul TouchUp’s medical coordinators. Furthermore, even though the world wide web has an abundance of information on Korean plastic surgery, take caution here as not every bit of information is true. Popular forums such as Purseforum or Soompi are common platforms for discussions on cosmetic surgery in Korea. However, information on them may be biased and unfiltered as anyone could come to incorrect assumptions or provide outdated information. Perhaps even more alarming is that large clinics have the power to dominate these forums and spread biased information about their “excellent” experience or reputation. Another risk is that freelancers who provide illegal practices are a dime a dozen in those popular forums. Before looking at the cheaper cost from such a service, one very important question should be asked. Is the advertised service or medical tourism agency legitimate? For the sake of safety, one should always avoid the service of freelancers who are not government approved medical coordinators. On the other hand, Seoul TouchUp’s Korean plastic surgery forum aims to eliminate any dishonest reviews or advertisement. Any interested person can start sharing their opinions today over at the TouchUp community!